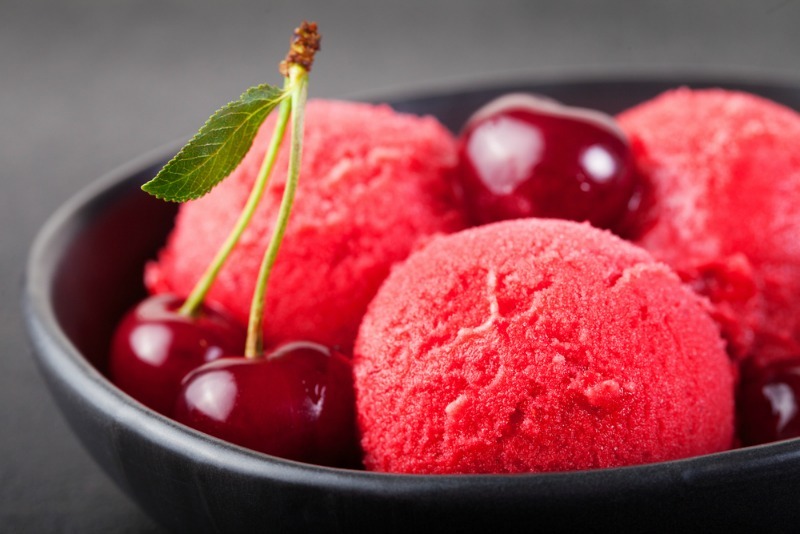 Create a refreshing cherry sorbet that’s perfect for the heat of summer. This is one of those simple recipes that’ll be a smash hit with family and friends. A sweet, cool dessert that showcases delicious cherries. Be sure to use ripe berries rather than morello cherries in a jar or can. The processed version don’t provide as much flavour or colour. Fresh cherries, ready for sorbet. If you don’t have an ice cream machine you can still make this dessert. Simply add the sorbet straight to the freezer instead of churning. After half an hour, remove and whisk until smooth, then continue freezing. If you have time, remove the sorbet 2-3 more times every half hour and whisk. This will make a less icy textured sorbet. Add 1 cup of water and sugar to a medium saucepan. Heat on medium until sugar has dissolved (simple syrup). Remove from heat and cool. Blitz the cherries and remaining water in a food processor until a fine puree forms. Add the simple syrup to the cherries and process for a few seconds until combined. Place cherry mixture into a container and refrigerate for at least 2 hours until well chilled. Churn sorbet as per manufacturer's instructions. Scoop sorbet into a container and freezer until hardened (at least 2 hours). No Replies to "Cherry Sorbet Recipe"